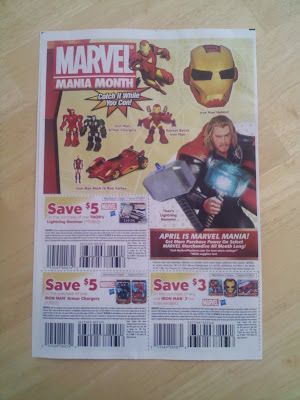 Kleefeld on Comics: Marvel Coupons? And that it includes coupons is a bit surprising, too. Especially that they're worth upwards of 25% of the suggested retail price. Now, my understanding is that a retailer doesn't HAVE to accept coupons. But wouldn't doesn't this incentivize consumers to go somewhere OTHER than comic shops? I doubt many comic shops accept them (since there are so very few coupons that would even be applicable to their merchandise) and, with their already typically slightly-higher-than-discount-stores prices, we're talking about a decent price break just by going to a big box store than you were probably going to stop at anyway. Obviously, Hasbro really doesn't care where you buy their toys. But this also suggests that Marvel doesn't either. Which further suggests that they're just as comfortable dealing with Wal-Mart as they are with your LCS. By no means is this any kind of proof that Marvel doesn't care about the direct market system; in fact, it probably says nothing at all, as it's possible that Marvel had zero knowledge about this ad prior to today. But it doesn't actually look all that great for Marvel from a DM perspective.